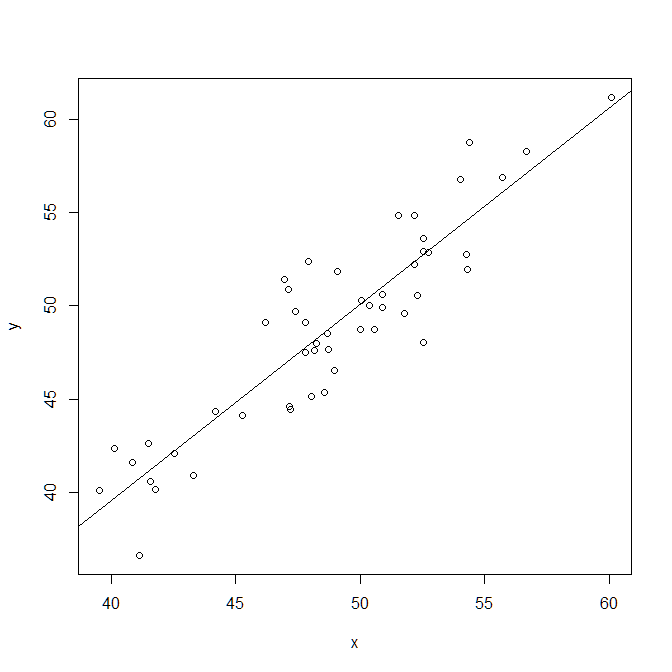 I want to document in one place some of the ways I carry out simple linear regression in R. To illustrate I’ll use a problem from Â the textbook Probability and Statistical Inference, 7th edition by Hogg and Tanis. The problem gives the times of 22 swimmers in the 50 yard freestyle at a hypothetical championship meet. For each swimmer there are two times: (1) their best time for the season, and (2) their time in the championship meet. We wish to regress the time in the meet on the best time of the season to see if there is a linear relationship between the two. Not too bad, I guess, though the variance seems to taper off in the extremes. 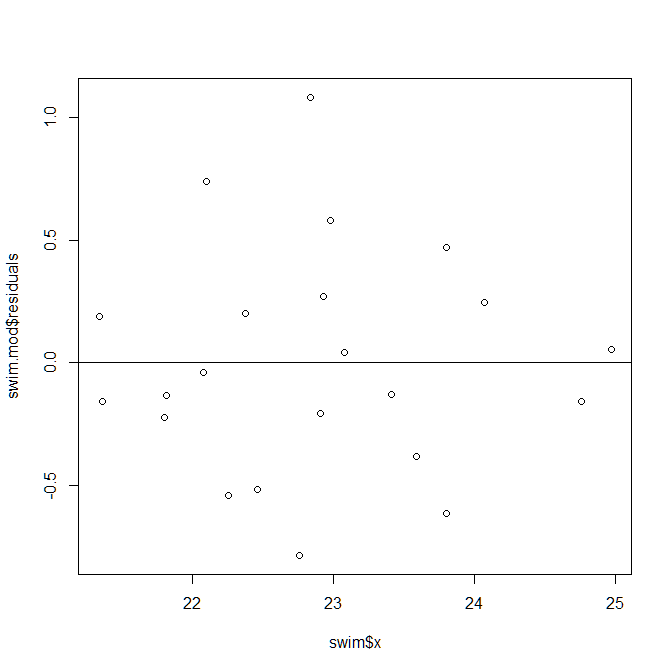 This matches what we see in the scatterplot and regression line, where the points in the extremes are closer to the line than those points in the middle. This suggests that swimmers with the better times in season tend to have the better times in the meet. Same with the slower swimmers. In the middle, however, we see a lot of variation. The lower bound of the slope is about 0.56 and the upper bound is about 0.88. We're reasonably confident the true slope is between those two bounds. The process we used captures the true slope 95% of the time. We'd like to think this time it worked and the true slope is in the interval of (0.45,0.88). 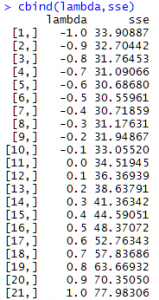 You can see it pinches in the middle where we have more data and thus more confidence about our predicted means. It appears on average that times improve in the final meet. For example, of people who reported a best time of 23 seconds during the season, the average of these same people at the meet looks to be about 22.5 (give or take a couple of tenths of seconds). 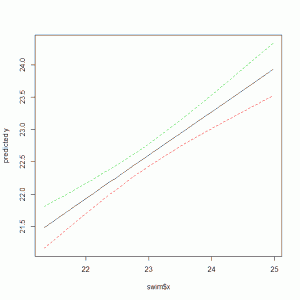 This entry was posted in Regression, Using R on March 19, 2012 by Clay Ford. When doing linear modelling, we make certain assumptions about the data. One such assumption is uniform variance. 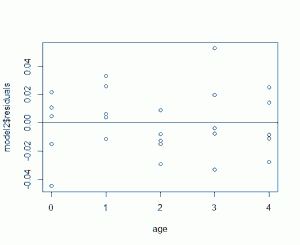 The fancy word for that is homoscedasticity. 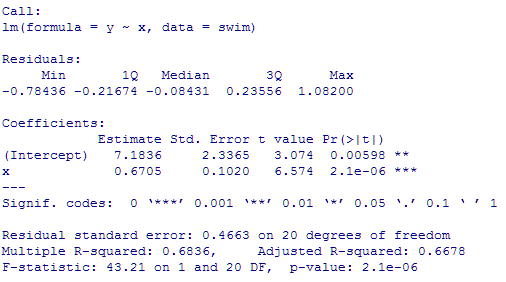 It means the variance around a regression line is roughly the same for all values of the predictor variable. 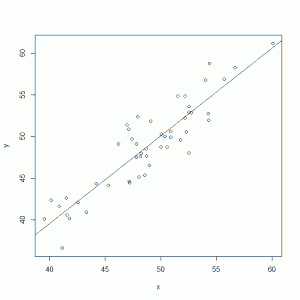 One way to check that assumption is to fit a linear model and produce a scatterplot of residuals versus the predictor variable. 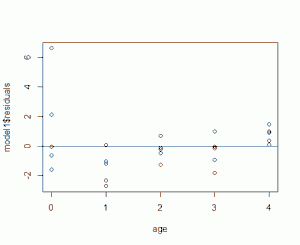 If the data are homoscedastic then we should see no pattern in the scatter plot. They should fall in a uniform random pattern around 0. 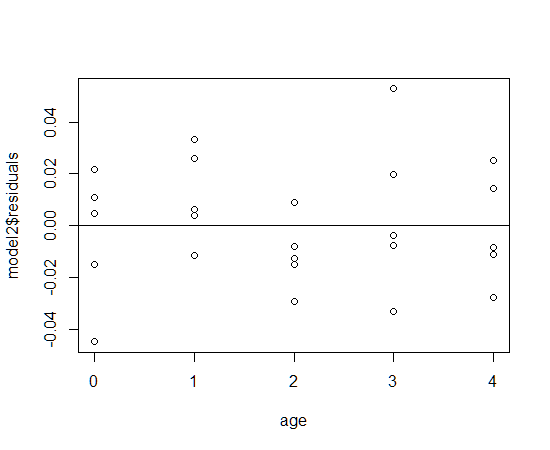 If there is a pattern, then our assumption of homoscedasticity is wrong and that’s a bad thing. Fortunately there is something we can do about it: transform the data. If you’re uncomfortable with the idea of transforming data, then just think of transforming inches to centimeters or Fahrenheit to Celsius. That’s the same thing. We apply a formula (or more technically, a function) to each data point and transform the data to a new scale. Then we re-do our regression analysis with the transformed data and hopefully see a nice uniform scatter of residuals versus the predictor. But how do we transform the data? There are plenty of options. We can take the natural log of the response. Or we can take the square root or inverse square root. Or we can square it or cube it. We can even take the inverse-arcsine. So which option do you pick? You can use trial and error. Pick a handful of transformations and see which works best. Or just do a log transformation. That’s a pretty safe bet to at least improve the residual variance. Yes, but this is math and statistics and we want to be efficient! We want a systematic way to pick the “best” transformation. Well, I can’t say that I blame you. 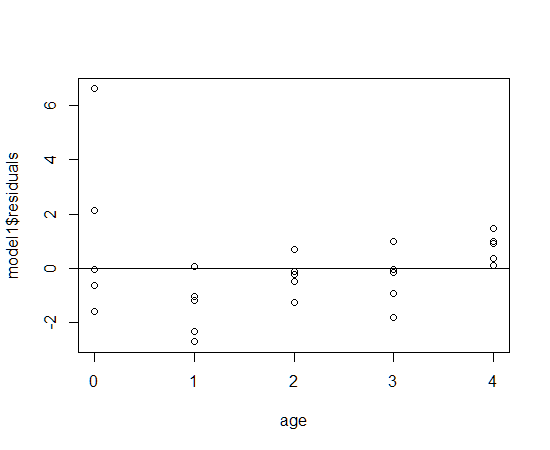 So here’s one way to systematically find the “best” transformation (as long as all the response data are positive). where is the geometric mean of the response variable. That is . So what we do is find the geometric mean of our untransformed response data, then use that in the standardized Box-Cox formula above with a specific lambda value, usually ranging from -2 to 2. That gives transformed response data which we then regress against our predictor. We make note of our Sum of Squares Error and then start over with a new value of lambda. The lambda that leads to the lowest Sum of Squares Error is declared our “best” transformation. For example, if lambda=0.5 gave us the lowest SSE, then we would transform our data using a square-root transformation. Let’s do a real-life example (or at least something that sounds like real-life). In a medical study, researchers collected measurements from 25 young children. Of interest is the dependency of the â€œplasma level of a polyamine,â€ (the response) on age (the regressor or predictor). Notice we take the arithmetic mean of log transformed plasma levels, and then take the exponential of that. As my professor in grad school told me in his notes, "The advantage of this approach is to avoid a build-up of numerical error." Now that looks a lot better, especially at age 0. 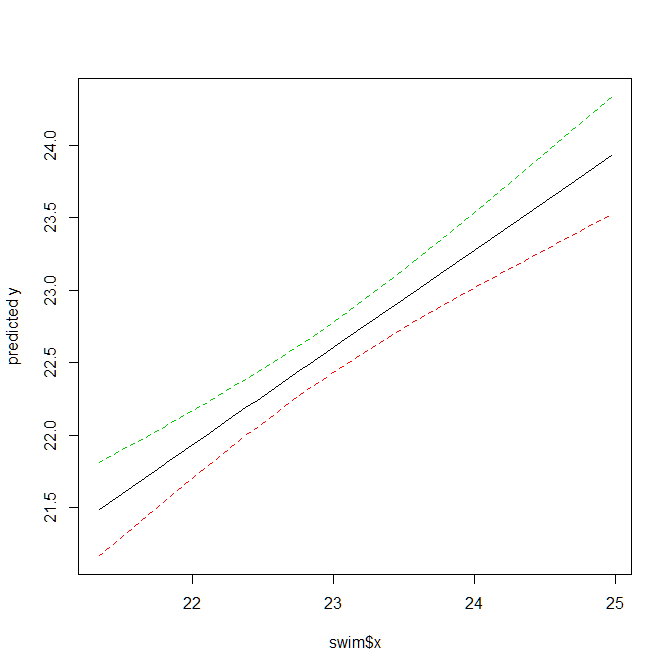 But now that we have a model that was fit with our response data transformed, how does that affect our prediction? It means we need to transform back. 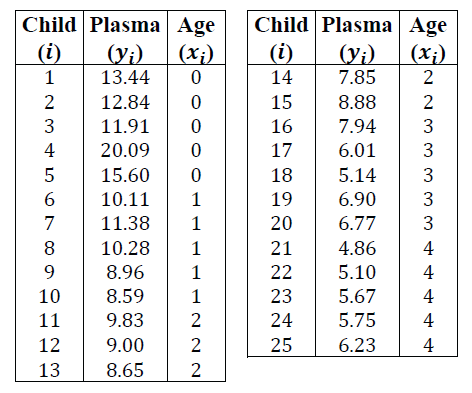 The fitted model for the plasma data after transformation is plasma = 0.26803 + 0.04006*age. 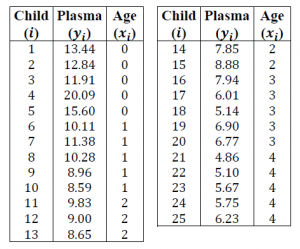 If we predict the plasma level for age 2.5 we get plasma = 0.36818. Compare that to our data above and you can see that doesn't make any sense. We need to apply the inverse of the inverse square-root to get it back to the original scale: 0.36818^(1/-0.5) = 7.376997. There we go. Of course use some common sense when applying this method. 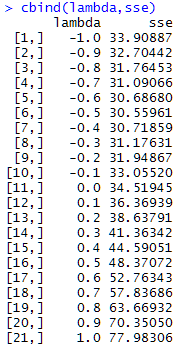 If the SSE values are pretty close together around, say, 0.4 and 0.5, it may make more practical sense to pick 0.5 (ie, the square-root transformation). Again I quote my grad school professor: "Scientific explanations or even standard conventions often carry more meaning than strict minimization of SSE." And by the way I should disclose the example above came from a course in Applied Linear Models I took at the University of Virginia. The only difference is the class used SAS. 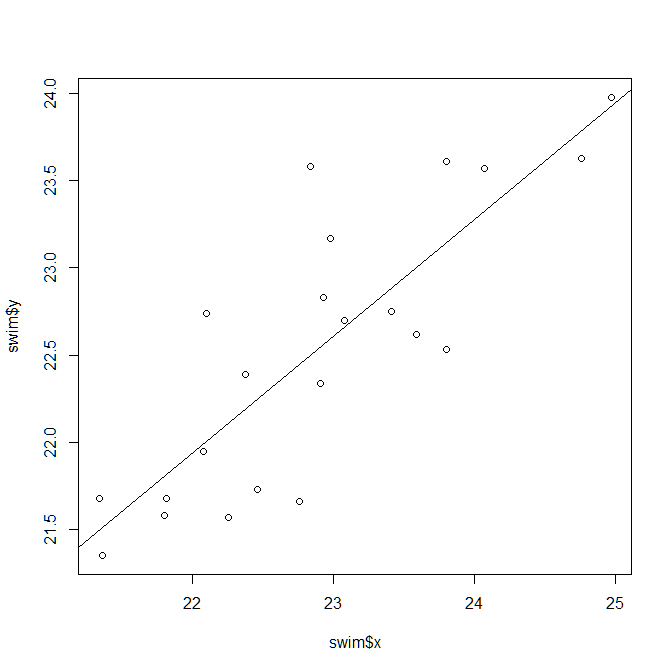 I decided to re-do the example in R.
This entry was posted in Regression on February 12, 2012 by Clay Ford. Do you watch NFL football? Further, let’s pretend they all answer, and they all answer honestly! Now I want to know if a person’s annual salary is associated with whether or not they watch NFL football. In other words, does the answer to the first question above help me predict the answer to the second question? 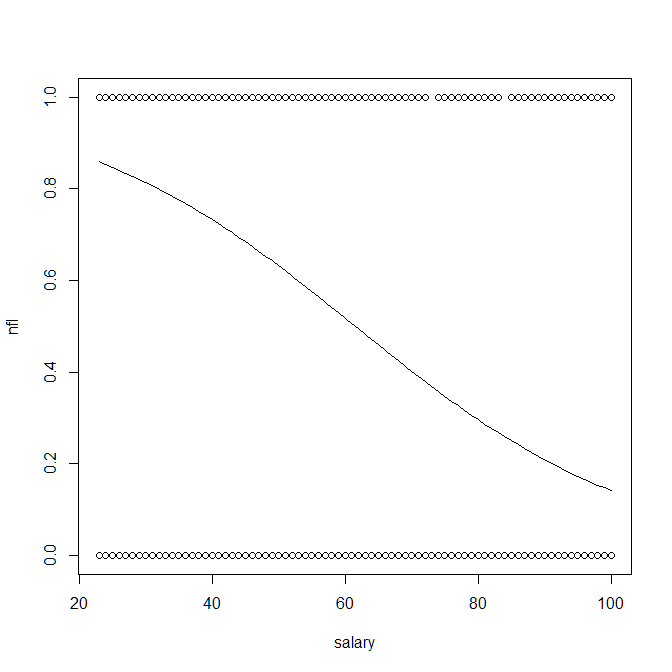 In statistical language, I want to know if the continuous variable (salary) is associated with the binary variable (NFL? yes or no). Logistic regression helps us answer this question. Before I go on I must say that whole books are devoted to logistic regression. 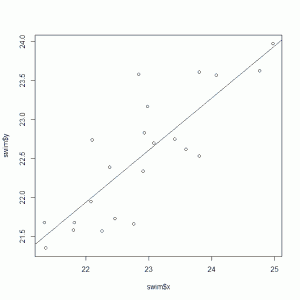 I don’t intend to explain all of logistic regression in this one post. But I do hope to illustrate it with a simple example and hopefully provide some insight to what it does. 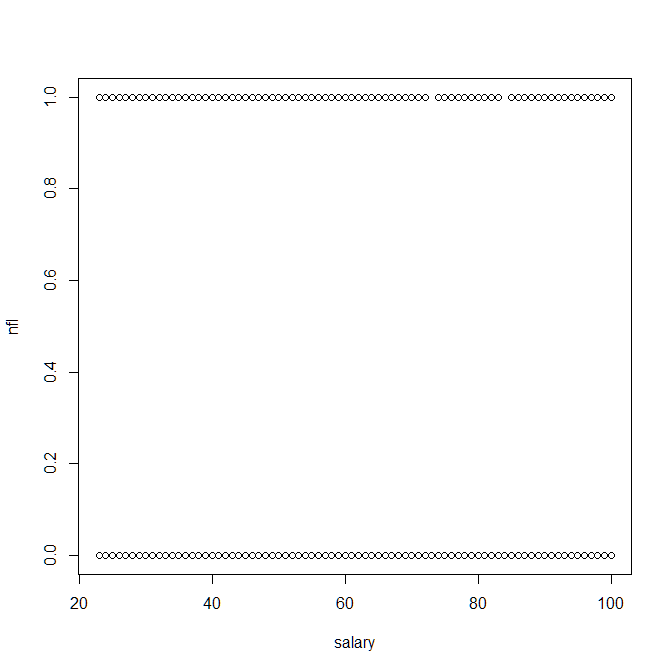 Trying to draw a line through that to describe association between salary and 0/1 seems pretty dumb. Instead what we do is try to predict the probability of taking a 0 or 1. And that’s the basic idea of logistic regression: develop a model for predicting the probability of a binary response. So we do eventually have “a line” we draw through the plot above, but it’s a smooth curve in the shape of an “S” that depicts increasing (or decreasing) probability of taking a 0 or 1 value. 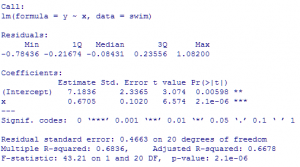 So we use statistical software to find the and values (i.e., the coefficients), multiply it by our predictor (in our example, salary), and plug in to the inverse logit function to get a predicted probability of taking a 0 or 1. Let’s do that. Trust me when I say that those coefficients are statistically significant. Our model is . Now we can use them to predict probabilities. 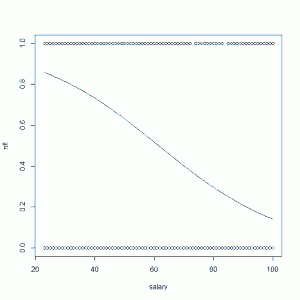 What's the probability someone earning $40,000/year watches the NFL? 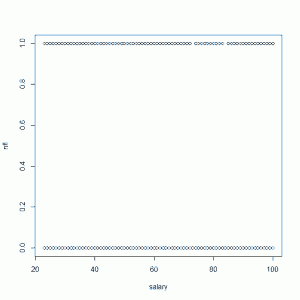 What's the probability someone earning $80,000/year watches the NFL? The line represents probability. It decreases as salary increases. People with higher salaries are less likely to say they watch the NFL. At least according to the world of my made up data. 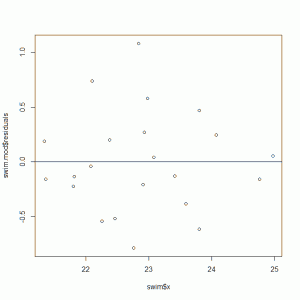 This entry was posted in Regression, Using R and tagged logistic regression on January 22, 2012 by Clay Ford.